When we moved to the Upstate in South Carolina four years ago, I had no idea that I would be kayaking in a cypress forest, frantically fleeing from alligators, swigging cheap vodka in a honky-tonk or getting up close to elk and black bears. With a home-base in Greenville, Barry and I have gone on both weekend and week-long wanders and had the opportunity to explore some spectacular locations that, prior to moving here, were never on our radar. While it is not my intention to create a ‘Top 10’ list, I want to share some highlights from our travel and photo experiences, most of which we stumbled on accidentally by either scouring Google Maps for places to put in our kayaks, through recommendations from nature photographers, or by simply just going for a drive and making a right turn. Greenville is tucked in the northwest corner of South Carolina and borders North Carolina and Georgia with Tennessee within easy reach and Florida within a ‘motivated’ driving distance, keeping in mind that over the last four years I’ve made 8 separate solo drives up to Toronto in one day - spacing my stops between strategically located coffee shops. I’ve framed these wanders from the furthest to the closest in distance to our home, with notes, highlights and the occasional link to previously published photos and stories. This is by no means a conclusive log of all our trips, and as I scour my photo library, I’m amazed at all the excursions we’ve made. This is only a small sample of our exposure to the South. A few years ago, over the Christmas break, Barry and I strapped our kayaks on top of the car and drove south to Big Pine Key located near the bottom of the Florida Keys. In our typical fashion, we managed to find one of the least touristy spots in an area that epitomizes tourism at the height of the season. Sure, we ended up sharing the place we rented with a family of roaches and a resident gecko, but hey, that’s the tropics for you. The location was ideal for day excursions in our kayaks where we paddled in crystal clear waters filled with tropical fish, skirted shores lined with mangrove forests, and sighted numerous birds and osprey. Highlights: Miniature Key Deer spotting and the National Key Deer Refuge, spectacular sunsets, tranquil and easy kayaking near Summerland Key. Note: We made this trip in late 2016 before Hurricane Irma devastated this area when the storm’s eye crossed Big Pine, Summerland and Cudjoe Keys and recovery has been slow. Check local sites for updates and places to stay. While a bit of a drive, a trip to Nashville is well worth the effort. As everyone knows, it is a country music mecca and a hoot to visit. While I don’t consider myself a fan of the country music genre, the gritty honky-tonks were fun, and watching people, dancing and shopping for fancy cowboy boots was a blast. Admittedly, parts of the main strip are corny and loud and people there have become caricatures of themselves (give ‘em what they want), but listening to the hard working musicians performing night after night, is well worth the trip. Note: One of the most iconic bars is Robert’s Western World and they typically have very entertaining musicians on stage. Another big surprise was all the fantastic places to eat including Hattie B’s Hot Chicken, and if you’re looking for something more than PBR and cheap vodka, check out The Patterson House. Please, please don’t feed the alligators. Over the course of the last four years, we have made three separate trips to the Okefenokee swamp. The first trip was an exploratory trip along the Suwanee Canal Road on the eastern side of the reserve and we were amazed at the diversity of the swamp, mostly curious about the alligators, and certainly excited to come back another time. The second trip took us to an even more remote area on the western part of the reserve near the town of Fargo - here we explored the various channels and became familiar with the alligators habits, even getting to know the names of some of the old-timers. The last trip, I entered confidently and deeper into the swamp, only to retreat with my tail between my legs with a renewed sense of fear and respect for these apex predators - they are habitual, yes, but like all wildlife, they are also unpredictable. Distance from Greenville: 340 miles, mostly side roads with few amenities. Highlights: Alligators, of course, solitude, Stephen C. Foster State Park is a designated Dark Sky Park, navigating through pinball alley in ocean kayaks! Note: If driving Highway 1 in Georgia, stop for lunch at Hardware Pizza in Lyons - best road pizza ever! Alligator sightings are very common and for the most part, alligators will not attack your kayak. While one did appear to charge toward me, I am certain that it was just going for cover and, thinking the coast was clear, popped up right by my paddle, twice. There is an estimated 10,000-13,000 alligators thought to be living in the 396,000 acres of the Okefenokee National Wildlife Refuge and to date, there have not been any attacks on humans. So, please, please don’t feed the alligators. There is no doubt that I love the mountains and exploring the backcountry, but I equally love the ocean and just like a walk in the woods brings me a sense of peace, watching the waves helps me feel present. So, every once in a while, we would pack up the car and drive to the coast, traveling as far north as Myrtle Beach and down to the Georgia Coast and into Florida. We have made a point of visiting Edisto Island several times and each time we visit Botany Bay Plantation - a 3,363-acre wildlife preserve. Between magnificent wild oaks draping over the marsh to the small mountains of seashells and deadwood scattered on the beach, this area is a photographer’s dream. 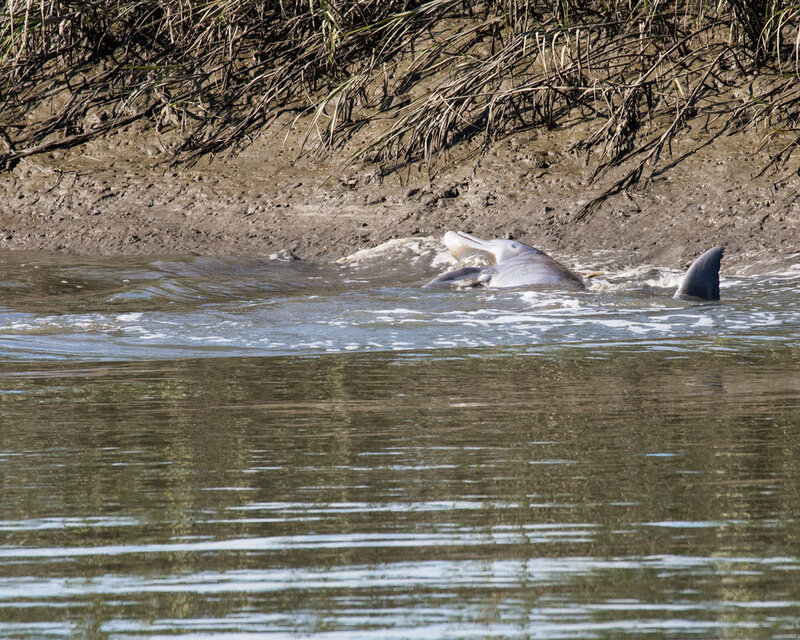 Not to mention we were lucky enough to witness dolphin ‘strand feeding’ - a unique fishing technique where they use their own wake to herd fish on the mud and then carefully semi-beach themselves to eat their catch. Highlights: Botany Bay Plantation and watching the unique hunting techniques of the resident dolphins herd the fish to the mud banks for easy pickings. Note: Be sure to check to see if/when the preserve is open. They are typically closed on Tuesdays and in the fall/winter, they close on certain weekdays for hunting access. It’s best to get to the beach as the tide is going out. And if you go to Edisto between May to October, you may be fortunate enough to spot the Loggerhead Turtles nesting - or at least you might be able to see their tracks from the previous night. This is one of those places that are truly spectacular, but for someone who enjoys the solitude that comes with being in nature, Cades Cove can be overwhelming and you’ll surely be annoyed by the numerous bone-headed actions of fellow humans. Car jams and stupidity aside, an early morning drive through the 11-mile loop is well worth the temporary annoyances. We have made the pilgrimage a few times, and each time we were rewarded with different experiences (with the exception of a huge wind storm that forced us to evacuate). Bears, sunrises, historical homestead sites, and so much more, it’s really worth the effort and temporary annoyances. Highlights: Bears, of course, and the breathtaking sunrises over the expansive valley. Note: While Cades Cove is one of the most popular areas in an already popular National Park (the most visited park in the US with over 11 million visitors calculated in 2017), you can still find ways to have a great experience there. Bring plenty of patience with you and you’re sure to be rewarded with some incredible sights. Tucked into the north east corner of Lake Marion, Sparkleberry swamp is perhaps the most surprising place we have found so far. Located southeast of Congaree National Park, we put in off a side road called Sparkleberry Landing Rd. The paddling is not challenging by any means, though it pays to keep your senses about you as it is easy to get lost in the maze of cypress trees. With the exception of a few local fishermen, we rarely see anybody, but have spotted numerous osprey, a rare limpkin, the occasional non-aggressive alligator and belligerent giant carp that will (purposely) knock your kayak to scare the bejesus out of you. Highlights: kayaking in incredibly still waters through a reflective maze of swamp cypress and wild bird spotting in this quiet part of South Carolina. Note: A GPS is handy as you explore the floating forest. There are several dead-ends that will have you backtracking. There are no amenities at the launch. This area is also part of the expansive Smoky Mountain National Park but is not nearly as popular as Cades Cove. The area is lush and appears to be cloaked in a thick green blanket. While this whole area is known for the many rivers, creeks and tributaries, the Big Creek area gives you lots of opportunities to explore. It doesn’t seem to matter if there are tonnes of people there, and you will most likely see locals splashing around in the creek, but a few steps away from the picnic area and you can easily lose yourself in the sounds of the cool, rushing water. Mouse Creek Falls is a relatively easy hike and in the spring, is framed by wildflowers and rhododendron. Playing with some video of flowing water at Big Creek in Great Smoky Mountain National Park and additional footage from the Blue Ridge Parkway. Highlights: Water, water everywhere. We could spend many hours walking up the creek, cooling off. Note: This is a great area to spend the day exploring around the creek or hiking up the side of the valley. This was also a great area to practice some long-exposure photos with a ND filter to get some great silky-smooth water effects. Lots of great hikes, especially in the Fall. When Barry first took me to Cataloochee Valley, it was, of course, at 5 am. With a thermos full of coffee, we left in the dark and began the drive down to the isolated valley on a mostly single-track and well-worn gravel road. By the time we got there, the mist was beginning to lift to reveal the expansive valley. The NPS re-introduced Elk to this area in 2001 and today you can watch them as they come down from the forest to graze on the grasses, play, and in the fall, spar to maintain dominance over their harem. As wildlife photographers and nature lovers, this truly is a unique experience to observe. We’ve come here again and again, and have always been rewarded during our early morning excursion. Highlights: Watching the elk, from a safe distance, is really quite the experience. When the elk retreat into the woods, there are many abandoned homesteads and hikes in the area to explore. Note: We love watching the sunrise in this valley. In spring we are rewarded with spectacular scenes as the mist lifts from the valley, and the sun sparkles on the early morning dew. Fall, of course, is another great time to visit and to observe the rut. The drive into the valley on Cove Creek Road is doable in a small car, and we’ve even seen a vintage 1920s model T there, but the road can get quite rutted and passing caravans of pickups hauling heavy horse trailers can be a bit of a nail biter and might require you to back up, being careful to avoid the steep drop-offs. The 469-mile winding highway that spans from Shenandoah National Park in Virginia to Great Smoky Mountains National Park in North Carolina is a roadway into the ancient Appalachian Mountains that have defined our time in the Upstate. While we haven’t covered any ground in Virginia, we have spent many days traveling the North Carolina portion, winding our way through some magnificent scenery, stopping for picnics along the numerous lookouts, making many hiking excursions and diversions in Pisgah National Forest and detours on the equally impressive, winding side roads. Mountain hikes into open meadows, waterfalls and expansive vistas - seriously, what more can you ask for? Highlights: A quick weekday or weekend getaway into the mountains with easy access to amazing hiking, scenery and solitude. Every season offers some spectacular photography opportunities with sunsets being our favorite as they reveal the depth and vastness of the mountains ridges. Amongst our favorite sports are Black Balsam Knob at Milepost 420, Craggy Mountains area at Milepost 364, Linville Gorge Wilderness Area at Milepost 316.4 (takes you the Linville Falls, further hiking accessed by the optimistically-named Kistler Memorial Highway, which is a rugged, pitted gravel road). Note: Even if you never leave the car, the drive is still extremely rewarding. I do, however, encourage you to do a little research (Asheville Trails is a great resource) park the car, grab a pack and hit the trails. Unfortunately, there have been several reported incidents of car break-ins in the parking lots, particularly at the popular Graveyard Fields at Milepost 418. One of the pleasures of being in the Upstate is living in our house! Our home is tucked in the trees and gives us a front seat to the mountains. We have watched the sunrise and sunset over Hogback Mountain, what at one time was known as the Dark Corner and a haven for Confederate deserters and a place where moonshiners hid from the law. We have watched curtains of rain wash over the hills, and have been treated to what might be a once in a lifetime solar eclipse. We’ve also had many visitors drop by - from herds of deer and their fauns, to fox, raccoons, turtles, snakes, owls, hummingbirds, possum and my personal favorite, bear! It will be difficult to say goodbye to our sanctuary, but we’re also looking forward to new adventures. Over the course of a few months, we captured a few critters going through our yard with motion cameras. It's kind of fun to see what happens when we're not looking! Highlights: Sunrise, sunsets and wildlife spotting. Note: We have since taken down the bird feeders that attracted the bears (actually, they destroyed two feeders), and we don’t like to threaten their lives by habituating them. As the area gets built up, there will no doubt be more and more bear encounters that will not turn out in favor or the bears.